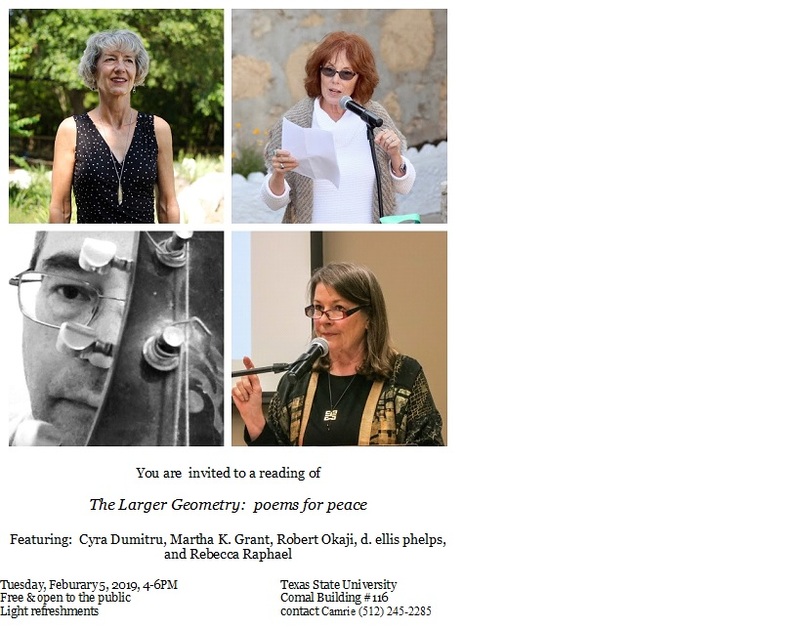 I’m looking forward to participating in “The Larger Geometry: poems for peace” reading at 4:00 p.m. on Tuesday, February 5, 2019 at Texas State University. We’ll read our own poems, but will share others from the anthology as well. If you’re able to attend, we’d love to see you. This entry was posted in Peace, Poetry, Readings and tagged creative writing, life, mindfulness, peace, perception, philosophy, poems, poetry, reading, writing by robert okaji. Bookmark the permalink. Oh, indeed tempting! Not sure I can swing it, but I do have it on my calendar. It’s been too long since I set foot on campus … high time something takes me back. What could be better than poets reading peace? Any idea where one parks to attend this??? I’ve sent you an email with the details I received. I hope to see you there! I’m going to be in Austin the end of the month. Too bad you couldn’t be reading then. It’d be cool to see you in person. Do you have time for lunch, coffee or a beer? Probably! I should have said the end of next month. I’ll be in Austin on the 27th and 28th of Feb. My niece and I are going to see Michelle Obama. Cool! That would be great. I’ve met 4 or 5 blog friends in person – it’s always fun. Let’s stay in touch!